SPY rose by 0.3% this week, to its highest weekly close since Decem­ber 2007. My account rose 0.6%, but my loss floor fell by 1.1%. TZA: First purchase using the revised swing-trading rules! The purchase date doesn’t match because the stockcharts.com price-data (used for the model) has become rather divergent from the Schwab data (used for actual trading). Oddly enough, the PPO_signal had become rather different but the PPO_histogram remained just about the same! Anyway, I replaced the historical Schwab data with the historical stockcharts.com data to resynchronize the robot to the model. 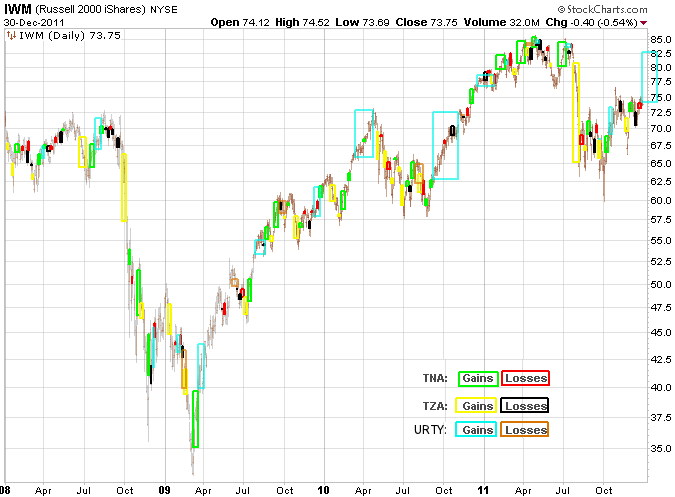 This chart shows that the small-cap index has bounced off the “critical support” line. What comes next? The index could jump solidly higher and continue heading skyward. It could go back up for a day or two, then either bounce off the line again or crash through it. Or it could gap down below the line on Monday, in which case the critical-support line will become a resistance line. I might have something! My new trend system fills in the periods when the swing system doesn’t do well. It has a decent win:loss ratio and makes a profit every year. For now at least, this is a long-only system because downtrends are usually over too quickly for this thing to recognize them. The trend system will buy URTY instead of TNA, to keep the systems distinct — this is necessary because they have different trailing-stop values. Both systems use hourly prices for IWM in their calculations, to make it easy to bolt the new system onto my existing trading-robot infrastructure. TRIX(176,15) is now above 0.00015 and had gone below that value sometime after the last sale. TRIX(17,20) is now below -0.025 and had gone above that value sometime after the last sale. TRIX(176,15) is now below 0.004. TRIX(17,20) is now above 0.033. TRIX(17,20) is now below -0.005 and had gone above 0.003 sometime after the last purchase. Have bought 2 or fewer tranches so far. Price falls to 90% of highest seen so far. For URTY, the worst loss in the last four years occurred in February 2009 (which was also the only activation of the 10% trailing-stop). Note that the tall brown rectangle partially overlaps a tall yellow rectangle, indicating that TZA was gaining at the same time that URTY was losing. The next biggest loss was August 2010; once again there is a yellow rectangle overlapping the brown, partially reducing its sting. The rightmost blue rectangle is for the trend from 2011 DE 29 through 2012 FE 03, which would have started off my 2012 results with a gain of nearly 10% if I had installed this system earlier!